Join Bridging and Chris Carr and Company on Saturday, December 1, for our 17th annual Bring-a-Blanket collection drive! Bring a new or gently used blanket to one of two locations and the first 100 donors at each location will win a chance at a SUBWAY® sandwich, concert tickets, screening passes sweet swag, and more! You could also score tickets to see SPIDER-MAN: INTO THE SPIDER-VERSE, screening passes for Second Act, Fandango tickets for Fantastic Beasts: The Crimes of Grindewald, Fandango tickets for Aquaman! We need more than 14,000 blankets each year to serve more than 85 households a week. We rely on community partners like you to help us help others rebuild their lives. 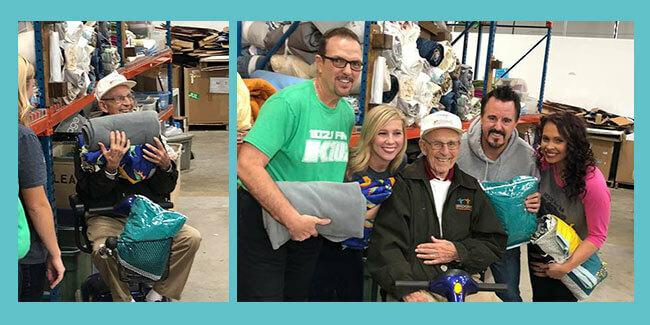 To date, the SUBWAY® Bring A Blanket collection drive has secured thousands of blankets to redistribute to people in need. We are grateful for their support in helping us serve our mission. WHAT TYPE OF BLANKETS DO WE NEED? QUALITY? No blankets with dirt, stains, rips, odors or animal hair. Your workplace, school, civic club, faith-based organization or your local community are all great places to host your drive. You can organize with just a handful of friends and family too! Use the promotions toolkit provided to help you get the word out. It includes templates, Bridging facts, logo, and social media samples. We need blankets all year-round! Call today!